In keeping with the March for our Life / Lives theme, I'm extending it to the Site of the Month. At our March here in Cleveland, people were handing out seed packets. Sunflowers to be specific. I took one package - which seems to have quite a few seeds in it - but the woman encouraged me to take many. Maybe she just wanted to get rid of her allotment, or maybe she really just wanted people to grown sunflowers. I never have, so I thought - what the hell. She said: come September of October (is that when they bloom?) she hopes to see hundreds and hundreds throughout Northeast Ohio. One of our gay neighbors (yes, I had to qualify that), grows them in this front yard right near the street. When they die, he spray paints them pink. Art, and all. Gay, and all. Anyhoo......the seed packets had a url: Seeds of Change 2018. The idea is to spread the word for political change. And to do it through distributing sunflower seeds. Make the world a better place with flowers and with changing out the current political climate. 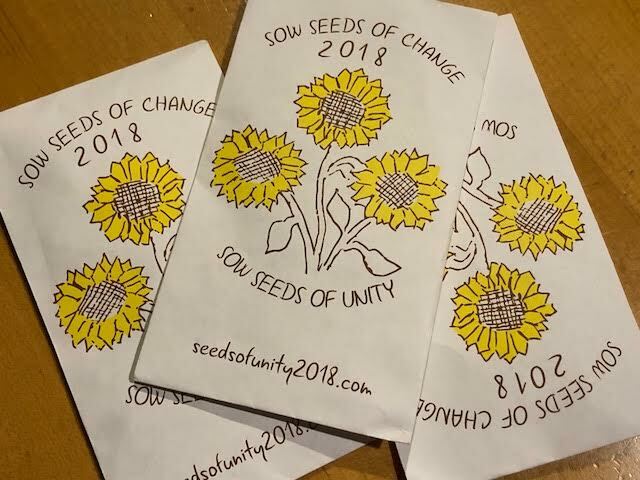 The site also tells you how to grow and care for your sunflowers - which is great, because, as I said, I never have, so this will all be new to me. I will be happy to share my progress from planting until withering. ....and maybe I'll spray paint ours as well after they perish. I used to grow those. Maybe I will again. I like this idea and look forward to seeing your sunflowers, both natural and spray painted.